The Shabby Stamper: Family Fun! I layered Pear Pizzazz, Cajun Craze, White, Early Espresso and a sheet from the Greenhouse Gala ds. The Cajun Craze layer was run through the BS in the Textured Impressions Perfect Polka Dots folder. The camper was watercolored, cut out and popped-up with Dimensionals. The 'grass' was made by snipping parallel cuts into a strip of Pear Pizzazz, then cutting the top of each 'blade' diagonally to give it texture. Wow, love the new look Lisa. I want this wallpaper. It really goes with your whole "shabby" theme. 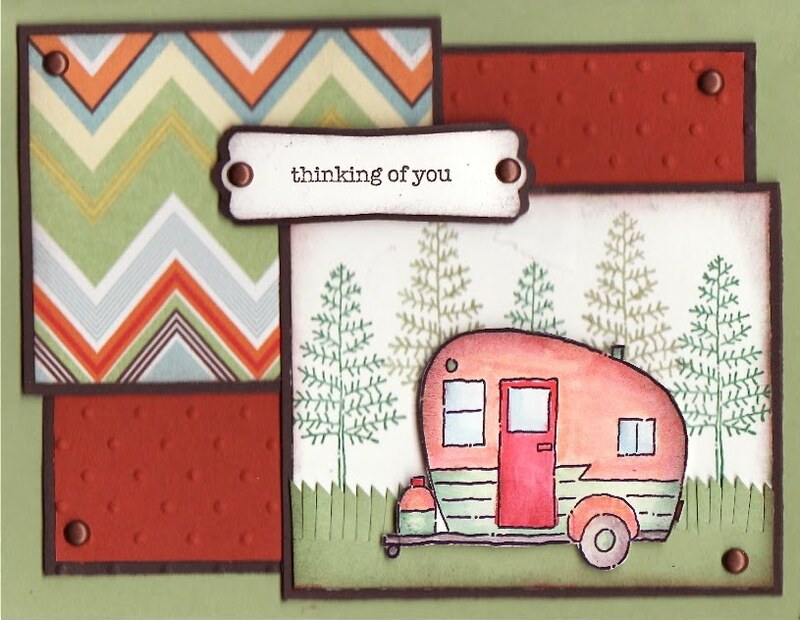 I love your "trailer" in your card. I actually thought I was on the wrong blog when it first came up because you really changed everything, including your card style. Its nice to have "change" isn't it. This card is great! I love how you put it together.